In the past five years, schools have had to pay more to participate in the Teachers Retirement System of Louisiana — rising from 15 percent of an employer’s eligible payroll in 2008-09 to about 25 percent in 2012-13. The short answer: The teachers retirement system is trying to make up for underfunding in past years, teachers retirement system spokeswoman Lisa Honoré said. The other state pension systems are in the same predicament; their contribution requirements have risen at similar rates. The state’s four largest retirement systems – the teachers system, the Louisiana State Police Retirement System, the Louisiana State Employees’ Retirement System and the Louisiana School Employees’ Retirement System – collectively have an $18.5 billion unfunded liability, which is the difference between what they should have on hand today to pay current and future benefits and what they actually have. 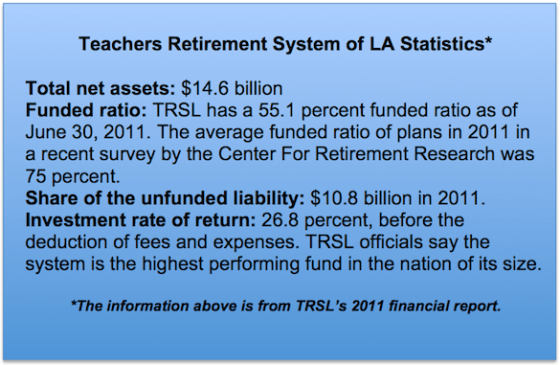 The teachers’ pension system was the largest share: about $10.8 billion. Current employers bear the burden of those past poor decisions. They have paid more in the last few years, and they’re expected to pay even more by 2029, when $5.8 billion of the debt is supposed to be paid off, according to a 2011 legislative auditor’s report. State lawmakers set that target date back in 1987, when the shortfall stood at $5.8 billion. Even when that is paid off, the pension systems would have $12.4 billion in unfunded liability, plus any additional debt that might come from future investment losses. The debt has drawn the ire of budget hawks and Gov. Bobby Jindal’s administration. Jindal himself has called the debt “irresponsible.” In January, he proposed a massive pension overhaul, but only one component – 401(k)-style plans for new hires – cleared the Legislature this spring. The new law doesn’t apply to teachers and hazardous duty workers, though. They’ll still be able to enroll in pensions. Initial, smaller payments on the original liability weren’t enough to pay off the interest. The systems have experienced investment losses, most of which have occurred in the last three years. When the state’s investments did make money, the state used half of them (which would have normally offset investment losses) to pay for cost-of-living adjustment payments for retirees. The state miscalculated how much it would have to charge in premiums in order to pay future obligations. The state promised additional benefits to retirees in the Louisiana School Employees’ Retirement System and in the Louisiana State Police Retirement System. Even more investment losses are expected this year and next, the report said, meaning the debt will climb higher. All these costs are passed to the employers that participate in the retirement systems. State law limits how much employees contribute to their pension. That leaves employers to make up the $18.5 billion shortfall in addition to their typical contributions to their employees pensions. This story is part of our report about New Orleans charter schools dropping out of the state pension system. It’s getting harder for the school to pay for increased contributions to the state teachers’ pension system.